On the 23rd of May 2014 I was invited to hold an ‘in-conversation’ with Quentin Bajac, the New York Museum of Modern Art Chief Curator of Photography, who was appointed in 2013. 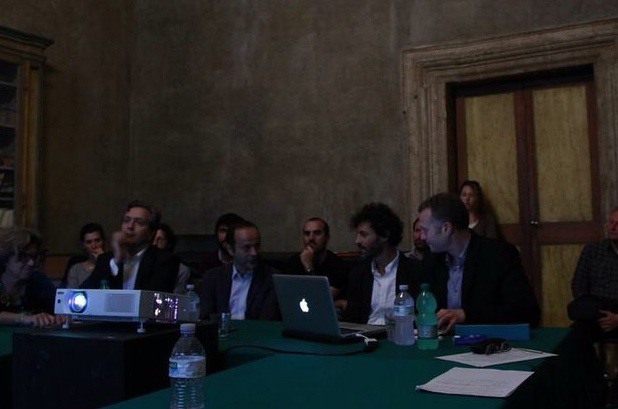 The event took place in the sixteenth century Villa Medici in Rome, before Fellows of the French Academy, local practitioners, curators and other interested members of the public. Entitled “Photography: Its Future’s Past and Present”, our conversation revolved around the question of the current and future position of the histories of photography written and advanced by Bajac’s predecessors at the MoMA’s Photography Department. One topic that kept emerging in our conversation concerned with the possibility of introducing new ways to consider what is photography in the context of an institution such as MoMA. In other words, what types of images, objects, technologies, social practices and cultural processes constitute the history of photography in the art museum. This aspect was of particular interest in my conversation with Bajac given the MoMA’s commitment to promoting its wide collection of past acquisitions, and thereby also their particular style of aesthetic and historical narrative. Bajac, who recently curated his first collection show at the MoMA under the title “A World of its Own: Photographic Practices in the Studio”, appears to be keen to carry on the work of his predecessor, Peter Galassi; that is, to further integrate photographic work into broader artistic practices and make the MoMA’s photographic collection more culturally diverse in its scope. In this context, it would seem that Bajac takes particular interest in work produced in cultures that have not yet gained much visibility in western museums of art, with a view to enriching the museum’s collection with photographic works that do not conform so easily in their style to the more well-known representational conventions that have dominated the art market since the establishment of the Photography Department at MoMA in 1940. On many levels, Bajac seems to hold the position that, in particular the introduction of new culturally diverse photographic work into the Photography Department’s collection will allow MoMA to advance one history of photography that is sufficiently inclusive, and yet also consciously restricted to the consideration of photography only in relation to the arts. If for the past 70 years or so the historical narratives about photography written by the MoMA’s Chief Curators of Photography have often been perceived as THE history of photography, Bajac appears to embrace the conceptual model that was initially proposed by the title of Beaumont Newhall’s 1937 publication, “Photography: A Short Critical History”. Led by Bajac, the MoMA’s Photography Department will, in other words, be committed to writing the most rigorous, diverse and comprehensive history of photography in relation to artistic practice, leaving the task of writing other histories of photography to other institutions. Quentin Bajac, Chief Curator of Photography at the Museum of Modern Art (New York), will be in conversation with Dr. Gil Pasternak, photographic historian in the Photographic History Research Centre at De Montfort University (United Kingdom). Bajac and Pasternak will explore how emerging untraditional curatorial approaches to photographic practices in dominant art museums may transform the way in which photography is practiced in the future, in the art world as well as in the broader social domain. How the museological and social histories of photography have re/defined its perceived sociocultural role and meaning? Are we now prepared to consider fine art photographic practice as equal in its sociocultural significance to any other photographic practice that exists on the photographic horizon? Given the recent incorporation of photographs of any type into the realm of fine art, is it the fate of all photographs to merge into one homogenous category of practice, chronological but ahistorical? Those are some of the questions that Quentin Bajac and Gil Pasternak’s conversation will revolve around, with a view to imagining what may be the future of past and current photographic applications.